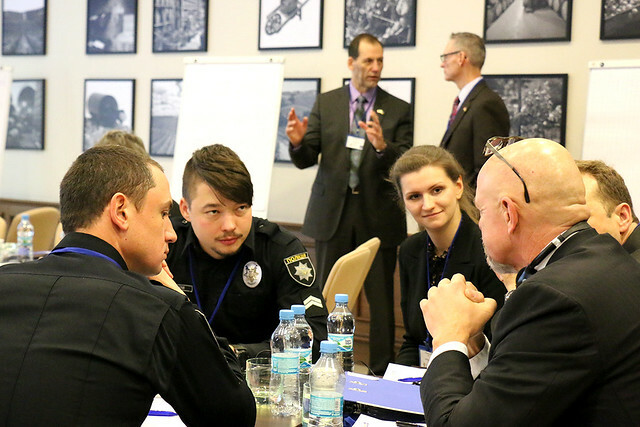 “We need to bring up a new generation of police officers”, emphasised Khatia Dekanoidze, Chief of the National Police of Ukraine while opening a 2-week training course in leadership for senior Ukrainian patrol police officers. The training course has been organised by AgriTeam Canada with the support of EUAM Ukraine. EUAM Advisors Tyrus Cameron, Guy Rook, Udo Moeller, Alain Scolan and Felix Gautsch are participating in the training as mentors. “We have mentors from Canada, police officers from Austria, Germany and France as well. We are trying to bring different perspectives and share our collective experience”, Tyrus Cameron, Head of the Strategic SSR Advisory Unit of EUAM, said. The training focuses on strategic planning, executive decision-making, critical thinking and problem solving, ethical leadership, strategic communications, knowledge of leadership, leadership styles and team leadership. Participants are working in groups with mentors who will follow them next week to their respective oblasts and work together on individual study plans. The cooperation between EUAM and Agriteam was formalised on 15 January 2016 with a Memorandum of Understanding and a number of further collaborations are planned.